Last time we added a piece of equipment called a superheater, positioned between the boiler and steam turbine, to our basic electric utility power plant steam and water cycle. Its addition enables a greater and more consistent supply of heat energy to the steam which powers the turbine. How much more? Let’s look at Figure 1 to get an idea. You may have noticed that our illustration lacks numerical representation. That’s because power plants are designed differently, depending on fuels used and power output required. So unless we’re talking about a particular power plant, number values would be impractical. For example, I could specify a boiling point of 596°F at 1,500 pounds per square inch (PSI), and a superheater outlet temperature of 1,050°F at 1,200PSI, and I could make note of esoteric things like enthalpy (British Thermal Units per pound mass) values on the Heat Energy axis. But to facilitate our discussion we’ll keep things simple and focus on the general process. 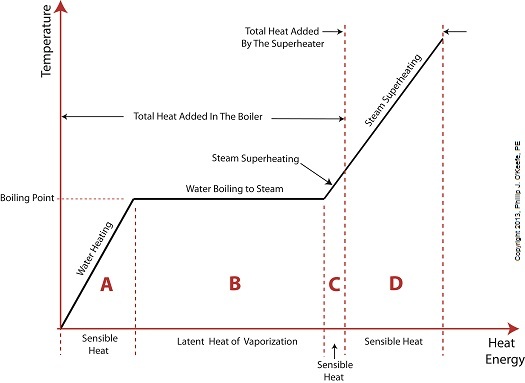 Figure 1 shows in phase D the additional heat energy being added to the steam, thanks to the superheater. This is significantly more than had been added by the boiler alone, as represented by phase C. The turbine consumes heat energy added in phases C and D and converts it into mechanical energy to drive the generator, resulting in electrical energy being provided to consumers in the most energy efficient way possible. But increasing power output and efficiency isn’t the superheater’s only job. The heat it adds during phase D ensures the turbine’s safe operation when it’s cranking at full capacity, as represented by the superheated steam zones of phases C and D.
Next week we’ll discover how the superheater prevents a destructive process known as condensing from occurring inside the turbine. This entry was posted on Sunday, August 25th, 2013 at 5:08 pm	and is filed under Engineering and Science, Expert Witness, Forensic Engineering, Innovation and Intellectual Property, Personal Injury, power plant training. You can follow any responses to this entry through the RSS 2.0 feed. Both comments and pings are currently closed.